Checking blood sugar often is great! But to get the most out of your data, you need to check at the right times. When you check your glucose at specific times throughout the day, every day, you can learn a lot about how different behaviors and activities affect your readings. Keeping a record of every glucose check -- as well as your meds, meals, and workouts -- takes a lot of the mystery out of diabetes, because you know where your blood sugar was when you started, what you did next (e.g., took medication, ate breakfast, went for a walk, etc. ), and what your blood sugar was after. Understanding how different choices impact your blood sugar empowers you to make better choices each day. 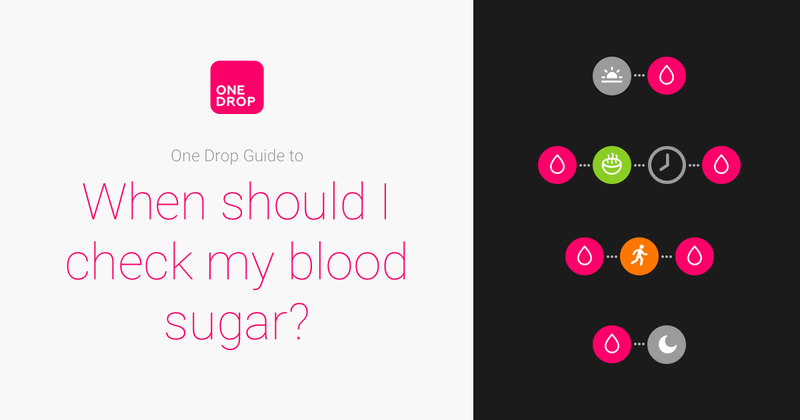 Check out this mobile-friendly One Drop Guide -- When should I check my blood sugar? -- for a detailed explanation of why you should check your blood glucose at certain times. Try out this structured approach to checking and let us know how it goes! We hope it will help you learn more about how your food, medication, and activity choices impact your diabetes management. In the end, the goal is always the same: figure out which choices get you the results you want to see! If you discover anything interesting, please share in the comments! Anything you learn could also help others in the One Drop Community.